The Journalism vs. PhD Showdown: One, Both or Neither? In a relatively recent post, Michael Bérubé answered a letter from an individual thinking of leaving journalism for a PhD program. This individual is wisely evaluating the potential risk and how grad school might affect his life later on. Now that print journalism isn’t a stable career path, what’s a person who wants to work with words to do? If you were to start a PhD program in 2011-12, you’d be looking at another four-five years of study, followed by … well, maybe followed by a better market in the years 2015-17, but maybe followed by a bleak market in 2015-17 made bleaker by all the people who didn’t get decent jobs from 2011-15. You don’t want to be adjuncting when you’re 35, this I know. And I don’t see how it’s possible to raise a family on adjunct wages (though many people manage to do it nonetheless). Okay, so maybe journalism is a better career choice than the academy after all. The odds are slightly better, even with the massive layoffs. I thought about linking to the article and saying it was cool, but then I tried to think of an answer myself. Must the answer involve an either-or: journalism or the academy? More after the jump! 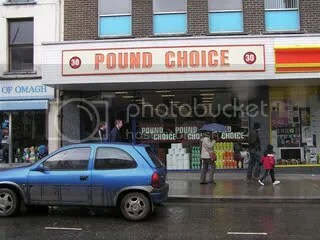 Image of Pound Choice, Omagh, by Kenneth Allen. On Wikimedia Commons under a Creative Commons license. I actually found my career through a series of lucky breaks and a fondness for computers. Now I am a content writer. Once I stopped thinking of literature and writing as a paper-only enterprise, my opportunities increased. That doesn’t mean it hasn’t been tough (thank you, layoffs! ), but there are many ways to apply writing talent that don’t involve journalism or the academy. As with anything else, good guys exist in advertising and marketing. The burden is on you to find them or to find a niche in the field that you are comfortable with. For example, I specialize in writing for the Web, not for print. Other people I know applied their teaching skills by becoming corporate trainers showing people how to use software. Still more become technical writers. You don’t have to go into computers. There are surprising opportunities out there that allow you to work with words without a) starving to death or b) feeling like a sellout. I won’t lie: You have to dig deep to find them. Sometimes people will tell you that you are crazy for not taking a certain path. But, if you are already accustomed to the hard work of journalism or academic research, you can break into a new career.